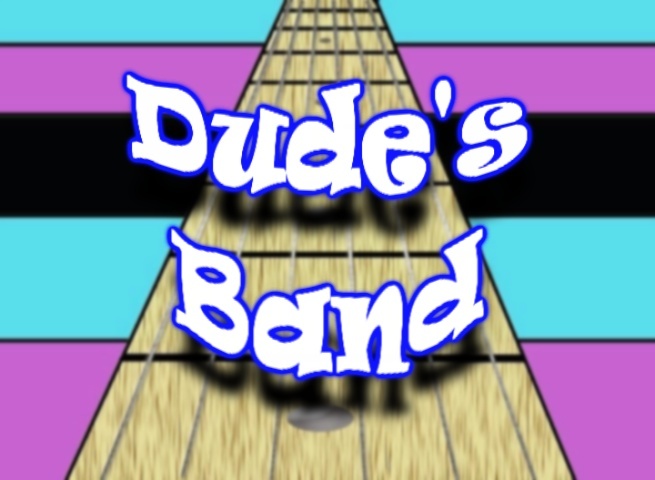 "Dude's Band" is an independent animated cartoon series that follows a rag-tag band of musicians and the crazy characters and situation they encounter on their journey from basement band to rock stardom. Behind the scenes, our hero DUDE is not the typical rock star type, though he always seems to make a big impression when it counts! His band mates MAN, CLEO and YO may get a lot of laughs at Dude's antics, though they always have his back. Pilot Ep. #101: "Let's Start A Band" - Childhood friends, DUDE, MAN and CLEO form a band with YO, the local music store owner. The band rehearses in Dude's basement, where DUDE'S MOM offers comic interjections and Motherly advice. The band auditions at CLUB 9, where Dude's song is a hit with the drunken crowd, so the club's owner MR. COPPERSTEEN and local talent agent, HARLOW SCARVEYDOG invite the band to perform at a battle of the bands the following week. Ep. #102: "Are You Ready To R-R-Rock!" � Dude's Band competes in a Battle of the Bands against the local favorite and two-time champions Band It, for a chance to win a free promo package and a guest appearance on "The Scary Gary TV Show". Band It tries to derail the the group's performance, but Dude's Band wins the upset victory! Ep. #103: "Get A Haircut and Get A Real Job" - Dude's Mom wants him to cut his hair and get a real job. But after being fired from two temp jobs (as a janitor and packaging tampons), the band convinces Dude to run for mayor and helps draft his mayoral candidacy manifesto. Harlow books the band to play for Dude's "pre-poll" party, though will he actually win the election? Ep. #104: "The Band Bus" � Cleo�s older brother has to go to China on business for two weeks, leaving her in charge of his house, while Harlow makes a deal with the band to buy an old tour bus. The band throws a party at Cleo�s brother�s house to raise money to pay for the bus. The party is a huge success, until Cleo�s brother unexpectedly gets home early from his business trip. Ep. #105: "Rock, Drop & Roll" - Harlow books the band for a music festival at a local campground. They are still not getting paid, though they are allowed to camp for the weekend at no charge. Dude and the band try their hands at camping, cooking out over an open campfire, etc., though the band gains a host of crazy new music fans and even get to meet a few of their rock idols backstage. Dude's Band began as an experimental animation project based on the true life experiences of show's creator, J.P. Lewis. Mr. Lewis actually began drawing caricatures of his early bands in the mid 70s, and later adapted them for the animated project in 2007. The production itself is hybrid consisting of limited animation (i.e. Rocky & Bullwinkle, Yellow Submarine, etc. ), flash animation, still life photography (music instruments, model / band posters, etc.) and digital video effects. J.P. performs the voices for most of the primary characters with Casandra Rose performing the voice of Cleo, while John Kaminski and Jessica Volke perform voices for additional characters in the pilot. The characters and backgrounds are drawn on a Wacom tablet with Adobe Photoshop and animated using Swishmax animation software at 15 fps. The voice tracks are mixed in Sony ACID Music Studio and used as reference to sync the initial animation scenes. The animations are rendered (without audio) and imported into Sony Vegas Movie Studio, where they are re-synced with the original voice tracks. Original music tracks, sound effects and digital video effects are added, mastered and rendered at standard 30 fps. The final production can then be formatted for DVD, internet, mobile, etc. If you have any questions or would like more information, please feel free to contact us via email. Click Here To Email Us For More Info!